Original Japanese interview can be found here. Thanks to Kerahna for translating! The image below is a graph of Yuki Kajiura’s happiness at different points throughout her life. A sketch of an artist and his wife, Kitano Takeshi’s new film, “Achilles to Kame” – the composer is Yuki Kajiura. With music that integrates beautifully with the images, we feel the strength of the composer that is Yuki Kajiura. I’ve never felt any pressure from working on this Kitano-directed film. Through this work, I broke through my personal restraints, gained entirely new experiences, and felt wonderful stimuli. Ms. Kajiura has done music for many films, animes, and games before – what kind of restraints did she break this time? To make music to match a film, often means making music to match emotions. For sad scenes, for lonely scenes, the music is light and easy to understand, and easy for composers to create. Of course, that means it’s totally unusable for a film like this, because in this film, whether one laughs or cries depends entirely on the individual viewer. Even in the sad scenes, laughter can be hidden, and if music is created to match only one of the two emotions, it would dilute Kitano’s efforts, so I had to avoid doing so. Then, I noticed that the films directed by Kitano have a unique and interesting rhythmic feel – a rare quality that no other director in Japan or in the world possesses. To put it simply, its a kind of “spontaneity”. Kitano’s past films are also like so, for example, a character’s spontaneous death. Often, there are ominous cryptic signs of the event before it occurs, that slightly escalate leading up to the event. The music should follow that kind of building up feeling, but is impossible to use universally (smiles). Because of this, I pretty much completely ditched the composing style I had been using up to now. I created music based not on emotions, but of paintings, and that made things much easier for me. Even if the emotion is unclear, it resonates with the background image. If the remnants of the image imprinted in my mind weaves nicely with the music, it’s a good thing. I never would have imagined these results came from such enormous effort, resulting in excellent public response to “Achilles to Kame” and its music. Your music both complemented Kitano’s unique film style and appealed to the audience’s feelings – this kind of universally approved music really shows Ms Kajiura’s talent. Ms. Kajiura’s life graph continues to escalate, accompanied by this kind of fulfilling work. The life that began improving after age 30 isn’t bad. I began considering music as a career at age 25, so the beginning was a little late. It feels like that rather than due to my ambition, the success I’ve experienced is more due to the luck given to me by people close to me. The first were my parents. I was very lucky to be born into such a wonderful family. After beginning my career, I was often referred from job to job – even this first collaboration with Director Kitano came with a certain degree of luck. 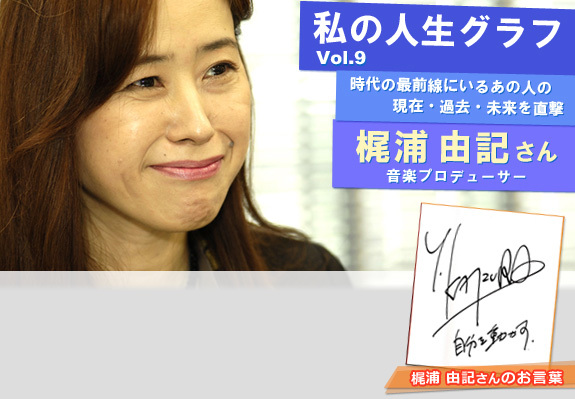 “Born into a wonderful family,” says Yuki Kajiura. It seems that the family is also the inspiration for her to become a composer. My father was a typical employee at a commerce/trading business, and truly loved opera. In addition to watching, he enjoyed singing opera as well, often bring grief to those living nearby (laughs). My father was later relocated to a branch in Germany, and before I could understand the world around me, I was attending operas with my father, and listening to him sing at home. I began learning piano when I started preschool, and played accompaniment for my father during elementary school. I called it accompaniment, but it was just a bunch of chords. As time went by, I began to fall in love with singing, piano, and opera. All the music in my life originated from this, my family. As a child, my dream was “to become an opera singer.” I was in the school choir from elementary school to high school; in this area I was quite persistent. It’s not that I wanted to sing for anyone in particular – I just wanted to be able to play the piano and sing at the same time. During elementary school in Germany, I heard much opera and songs, and I began listening to western pop and rock music after entering high school. I was especially crazy about The Beatles, and I have no idea why I memorized the lyrics to all their songs. About 200 songs. I even made lyric flashcards. I guess this is what you call passion (laughs). In the end I never did become an opera singer. Looking back, I think the turning point happened after high school. Ms Kajiura’s life seems to approach the bottom of the valley during the time from high school graduation to university. During high school choir, I wrote an original song for the choir. It was a lot of work bringing the song to the stage, and having it performed by 30 vocalists. I bribed my friends with ice cream in my attempts to convince them to join. Just as I began to become utterly annoyed at the situation, a school band invited me to play keyboard for them. I remember the band consisted of five girls. To get the entire band to join me, I just needed to buy them 5 ice creams! With this kind of joyous feeling at heart, I made the transition. Then… my father passed away before I entered university – an enormous change in my life. My financial situation wasn’t great either, and I became addicted to part-time work during university. Part-time work to pay tuition, while attending band activities. Then into the workforce. Despite changes in her life, she never was far from music. Although members came and left and reduced in number, I had maintained band activities for my 4 years in university and 3 years of work afterwards. Everyone dressed in white, walking onto the stage amidst the sound of bells and beginning to sing a capella, it was a very interesting band and very close to visual senses. However, I had never planned to make music a career. Although Ms Kajiura originally wanted to be like her father and have music as just a hobby, the god of music would not so easily let her talent go to waste. I realized I didn’t have time to follow both my career and my music hobby, and gradually my interest shifted more and more towards the music side. When I wanted to make more music, some people asked me “you found a way out?” Already past age 25, what a coincidence. My mother and my boss both asked me, “are you serious?”, and expressed strong opposition, but in the end I decided to quit my job. In 1993, the 3-member group, See-Saw, debuted with their single, “Swimmer”. In 1995, Kajiura began solo work, producing music for animations, movies, CM, stage musicals, games, etc. See-Saw’s 2005 single, “Anna ni Issho Datta no ni”, the ending theme of Gundam SEED, reached #5 on the ORICON list. This is the elegant transition from an OL to a music producer, by Yuki Kajiura. 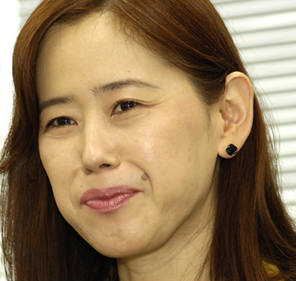 In 2008, Ms Kajiura has accomplished several new projects. Apart from the soundtrack of “Achilles to Kame”, there is also the 5th part of “Shin Hokuto no Ken” that began in 2006, set to premiere on October 11. In addition, she continues to work on the music for all 7 chapters of “Kara no Kyoukai”, including the Kalafina theme songs. She also tackled her first live concert in collaboration with Sound Horizon’s Revo. Ms Kajiura who transcends all types of media, from where exactly does the source of music originate? I get inspirations from art and books. Things with sound, such as music, movies, and television, do not work. Because I can hear the sound, I’m unable to make music from it. When I’m preparing to begin composing, I light some candles in my room, and start to look through some artbooks and novels by my favorite authors to get me into the mood. Some books can make music, you know. It’s because the literature has a certain kind of melody. Through a hard to understand but nonetheless realistic, and slightly mysteriously, music floats out of the story. For example, Aimee Bender’s short story collection, “The Girl in the Flammable Skirt”, and Isabel Allende’s work, etc. I also read some books that do not make music before I go to sleep, because if I read books that make music, I won’t be able to fall asleep (laughs). Of the books that do not make music, her favorite is the “Moomin” series by Tove Jansson. Animes are fun, but novels are very interesting also. Because short stories are very easy to read, it’s really kind of cruel. Of the bands that I really liked, 6 of them are from northern Europe – I seem to get along well with that area of the world. New Age, electronica, northern Europe seems to always be doing some really interesting things. I feel that my own music has been influenced somewhere by the artists of northern Europe, although I’ve never actually travelled there myself (laughs). I don’t particularly want to go there either – I feel that it’s best to not visit the places one wants to visit most (laughs). Northern Europe is probably nothing like the northern Europe I have in my imagination, and I want to protect the ideal image that I hold in my mind. Apart from music, what are Ms Kajiura’s hobbies? Listening to music, reading, sleeping (laughs). I like to drink (alcohol) with friends. I also like to make my own fruit wines. I use about 10 different kinds of plums, cherries, etc. When friends come to visit, we sit and drink it together. In those who discover their talents at a young age, there are many like Ms Kajiura who have spent time as an OL, and then found the opportunity to escape. Ms Kajiura says that she herself is a late starter, but also valuable the 15 years of experience collected before the great escape. The secret to my continuing, is my inability to stop. I feel that year after year, maintaining my creative machinery becomes harder and harder. However, as long as I have motivation, I can make it through anything. Because of this, I would go and listen to good music, and then think to myself “I won’t lose to this!” – that gives me endless motivation to keep going. To give up is very easy, and can be done at any time. I’ve also seen many people who are extremely talented, but gave up. However, once one chooses to give up, a second change is extremely hard to come by. Because of this, I would never abandon a half-finished piece, never easily give in, never work half-heartedly, and I believe this is the most important thing to commit to heart. To myself and to my music, I must be fully satisfied. Finally, we want to understand your plans for the future. These past few years I had repeatedly worked between office and studio, but I immensely enjoyed the Live performances held this year that I had long awaited. This is how I learned that compared to composing alone at a desk, the feeling of performing in front of an audience is totally different. As a composer, there are many ways to enjoy music, and I really cherish this new discovery. Before I switched to the music profession, I had always focused on performances with my band, and felt true passion for performing. Next year, I think I will reduce my composition work, and spend more effort working on live performances. I also want to tell everyone, motivate yourselves. It will be very difficult and even laughable to convince people to feel passionate for things that you yourself cannot fully love. The melody playing in your own heart, may resonate and echo in the heart of another. In order to motivate someone else, you must first motivate yourself. You must first put all effort into the creation of a tune that touches your own heart, and pass that very emotion on to each individual listener.